In the case of Italy it took nearly three months, following the 4 March general election, to negotiate a coalition between the Five Star and League political parties. In Spain Sánchez’s inauguration was the day after the People’s Party (PP) government had been defeated in a vote of no-confidence. There is nothing progressive about the new government in Italy. It is comprised of the right-wing populist Five Star Movement and the overtly racist and xenophobic League. The left is almost absent. The Democratic Party got just 23 per cent of the vote at the general election, laid low by Italy’s Blarite leader Renzi. The new government’s promises of reducing the pension age and abolishing an increase in the sales tax are undoubtedly popular. But by far its biggest fiscal commitment is to slash corporate taxes. That shows the real priority of this new right government. By contrast, the socialist PSOE party has come to power in Spain by ousting the corrupt right-wing Partido Popular (PP). With just 85 of the 350 votes in the Cortes, PSOE will have to rely on the votes of Basque and Catalan nationalist parties and the leftist forces of Unidos Podemos. But PSOE too is a Blairite party, and has already committed to leaving the PP budget unchanged. That may be the intention, but it is sure to come under pressure from some of these forces at least to end further austerity measures, if not reverse them, as has been done with some results in Portugal. These political developments, and the on-going problems in Greece, reflect both the instability in Western politics caused by economic stagnation following the financial crisis and the structural impasse within the Eurozone. The largest manufacturers in the Eurozone gain enormously from there being one currency – as competitive devaluations are ruled out. They also benefit from the relative weakness of the Euro. So when the Italian political crisis caused the Euro to fall on foreign currency exchanges, this benefited the EU’s most productive companies, mainly in Germany. For these reasons, French and German capital in particular cannot allow the break-up of the Eurozone and the EU. In the previous European crisis, the European Central Bank, the ratings’ agencies, the IMF and the Commission acted in concert to bring one country after another to its knees, first Greece, then Ireland and Portugal. But they had to call a halt when the same process was threatening to engulf Spain and Italy. They are too big to lose. Recently the EU economy has been going through a better period of growth. At the end of 2017 GDP in the Eurozone grew by 0.6 per cent, up 2.7 per cent from a year earlier. That momentum may have continued into the first part of this year, with data for the first quarter due in the next few days. Even so, there is already evidence that the economic outlook is slowing once more. The Eurozone Purchasing Managers Index (PMI) has fallen for five months in a row up to May. For individual countries, the latest reading of the manufacturing survey was at a nine-month low for Spain and 18-month low for Italy. The gyrations in the value of the Euro versus the US Dollar seem to be responsible for the feeble see-saw of effect of US and European growth rates, and previous Euro strength has curbed European growth while giving a modest lift to the US. This highlights the structural nature of the crises in some of the countries in the Eurozone economy, where monetary union imposes a uniform nominal interest rate and exchange rate on all countries, but there is no fiscal union to provide funds that might offset the uneven effects of the monetary union within those countries. The EU Commission seems to recognise this difficulty but is not at all willing to correct it. 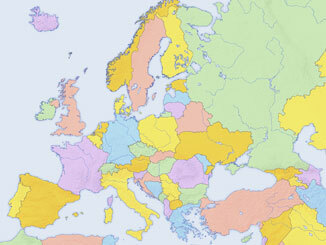 In its shake-up of regional cohesion funds, the Commission has allocated more funds to Italy, Spain and Greece. But this is to be achieved by chopping funds to countries in the east, with the total budget being cut. This will not solve the problems in the south of Europe and threatens to create difficulties in Europe’s east. So, the impasse will continue. Spain and Italy cannot be allowed to leave the Euro, or even brought to the point where these countries’ creditors would need to be bailed out. Neither the new governments in these countries, nor the European institutions are willing to allocate the funds that could underpin an investment-led recovery. Greece is a different case. A significant section of German capital was prepared to see Greece leave the Euro and former German Finance Minister Schauble fought an unsuccessful battle to push the country out. That crisis also continues. German Chancellor Merkel cannot accept the IMF demand for debt restructuring without hurting already-weakened European banks and establishing an uncomfortable precedent. But if the IMF is now excluded, the European authorities are exposed to any renewed Greek inability to make its debt payments. In any event, the strong recovery that Greece needs is precluded by the further austerity measures that are always demanded in every round of talks.